Just 6 years after the first cloned canine by scientists from South Korea, ironically a country which has dog on the menu, the practice has evolved tremendously and has already provided important results. Some animal specimens are immensily separable from the rest of its kind, whether their smarter, stronger or more productive, so why not have more of these and breed only the best? 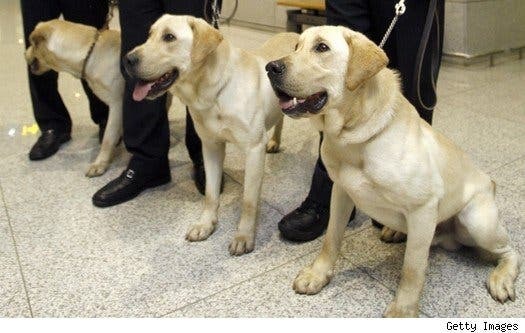 In South Korea’s Incheon Airport, their best drug dog-sniffers are clones, replicas of a prized security dog named Chase. The clones, seven labrador puppies (nick-named “Toppies”, short for “tomorrow puppies”), are currently studied part of an effort to accurately determine whether the cloning of prize animals can deem results. So far, the toppies project has been a complete success since its inception in 2007. Usually, only 30% of the conventionally raised pups manage to pass the drug-sniffing test. The toppies, Chase’s clones, however all passed the test – 100%! Normal dog training costs $40,000 a piece, while the cloning costs $100,000 a pup. As you can see, it’s already more economical feasible to direct efforts towards cloning, everything depends now on public perception. The increasing success of animal cloning will not go unnoticed, and the future will most likely store more and more cases and advances. Scientists have already managed to clone a transgenic cow capable of lactating human protein milk, the best Bessy in the park. The most exiting prospect for cloning in the future is genetic resurrection – the cloning of extinct species. Jurassic Park, anyone? Dog cloning first began in South Korea in 2005, when Byeong-Chun Lee of Seoul National University presented to the world the first successful attempt of its kind. You might know him from our earlier report of the cloned dog that glows in the dark. Think what you will of him, but despite his eccentricities, he’s the leading global expert in the field. Under his supervision several dogs have been cloned, as well as endangeroured gray wolves. The future holds promising prospects for cloning, prejudice aside. If you’d like to find out more regarding the drug-sniffing cloned dogs in South Korea, in this documentary video from CNN which follows four year old Tutu, one of the best dogs at the Incheon Airport, and the project’s exploits.